Above article does not say much about EV 2022 Macan but implies facelift ICE models will continue to be produced alongside as long as there is demand but suggests little further development. That just popped on my feed. In typical journo fashion it seems like a lot of words for such little meaningful information. Pleased someone could translate. Ta! The Porsche Macan could from 2022 as Battery Electric Vehicle (BEV) exclusively electrically powered over the streets roll. 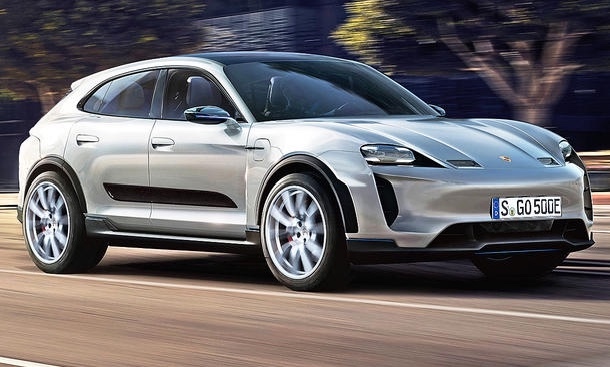 According to first information, the sports car manufacturer from Stuttgart will present the next vehicle with an electric motor in the form of the Porsche Macan BEV (Battery Electric Vehicle). The Porsche Macan BEV (2022) is said to have the first information about the new 800-volt architecture, which is also expected in the Porsche Taycan. Equipped with this technology, the electric cars should not only drive fast, but also be recharged quickly. "About 400 kilometers of electric range in less than 20 minutes," promises Stefan Weckbach, head of e-mobility at Porsche, which also drives the Project E mission. The Swabians do not yet reveal precise performance data. Expected is the Porsche Macan BEV 2022. Until then, the development of the electric car kit PPE should be completed. If it looks like that, they can keep it! Even Moore's law (after over 50 years! ) is now slowing, unfortunately battery/power cell tech has moved at a snail's pace with high capacity Li-ion still in relative infancy. There are lots of LIB variants being trialled, tackling recharge control is complex, power output is no problem. Capacity, range, lifespan, recharge and disposal are all as yet unresolved. If Lithium is the chosen future material where is it to be found in quantity, (it has to be mined) not entirely a green practice. One of the greatest Lithium rich land areas in the World "Afghanistan". Whilst Hydrogen may well be considered too costly and unstable to handle recharge it may well prove to be the most suitable long term solution. Suggest those developing EV platforms also consider how to retrofit a hydrogen power cell in place of the redundant battery. I don't think they are likely to go down the route of ever larger battery capacity for a number of reasons and instead focus more on minimising weight and cost, while hoping that the charging infrastructure will make 400 km range acceptable to most people. The only genuine issue with that kind of range should be the availability of high speed charging on your travels. For reference the weight of a current 100 kWh battery is around 650 kg and that is about as heavy as you can go without really crippling the ride and handling. That's why Porsche in particular are likely to stick with sub 100 kWh batteries for quite some time. Any improvements in range would have to come from increased power density and doubling that is certainly not likely in the next generation or three and if it did happen that really would be the end of the line for ICE! Tesla are touting their new Roadster with a 200 kWh battery and 600 mile range, but nobody knows yet what it will weigh and unless they have a massive game-changing secret up their sleeve it can only be a very big number as it would be carrying a 1000 kg+ battery with current tech. Even Moore's law (after over 50 years! ) is now slowing, unfortunately battery/power cell tech has moved at a snail's pace with high capacity Li-ion still in relative infancy. There are lots of LIB variants being trialled, tackling recharge control is complex, power output is no problem. Capacity, range, lifespan, recharge and disposal are all as yet unresolved. If Lithium is the chosen future material where is it to be found in quantity, (it has to be mined) not entirely a green practice. One of the greatest Lithium rich land areas in the World "Afghanistan". Whilst Hydrogen and it's required infrastructure may well be considered too costly to develop now, recharge at a station takes 5 minutes! It may well prove to be the most suitable long term solution. Suggest those developing EV platforms also consider how to retrofit a hydrogen power cell in place of the redundant battery. Only issue then is how best to cleanly generate fuel at the station. From what I've read, it doesn't look like the availability of lithium is going to be an issue in the next 100 years or more. It reminds me a little of when oil was supposed to run out before the turn of the last century. There are clearly environmental issues with "mining" lithium, as there are with oil. I thought South America and Australia had the biggest lithium reserves, or at least that's where most of it is currently coming from today. Afghanistan may well have large untapped reserves, but they are just sitting there for now. It will probably make them rich one day! Not a very informative article then! I don't think their EV plan has had any bearing on why the Macan has just had a facelift, it would have been due for one regardless in its normal product lifecycle. The big question is whether or not Porsche will make only an EV Macan after 2022 or develop an alternative ICE/hybrid SUV platform in parallel. Obviously they would have to be completely different platforms and compete directly against each other in the market.